Welcome!! Lancashire Constabulary Sports Club are pleased to be hosting the 2019 Police Sport UK event on Wednesday 10 April. The last time Lancashire hosted the PSUK Cross Country was back in 1991 at the Lancaster University! The evening presentation, meal and function is also on Campus! Starts from in front of the new state of the art University Sports Centre. Each lap is 1.8 miles. 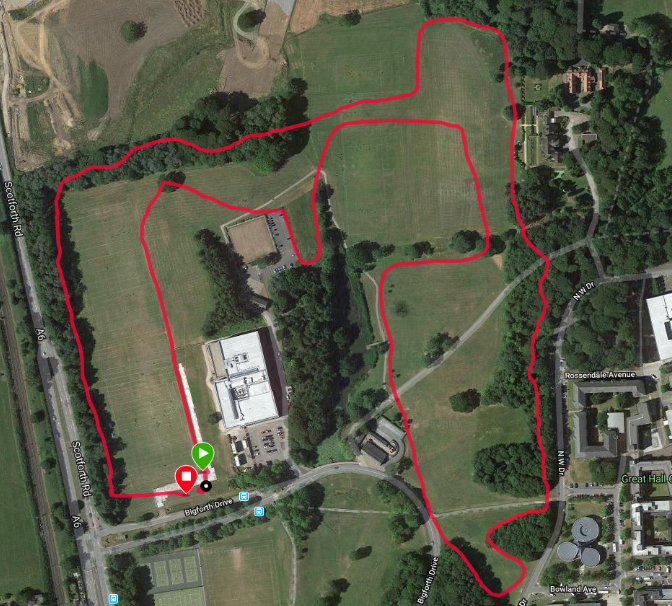 The course is very scenic, a mixture of grass and woodland paths located in the grounds of the University. - it is not too hilly but there are several steep but short climbs with a number of fast, flat sections. It is suited to spikes with no hard surfaces. The number of entries we will accept is unlimited. However, there are limits on the presentation function and accommodation. The £15 race entry fee covers the cost of race numbers, prizes, results, post-race refreshments, event memento and other event running costs. We are producing a quality event 'T' shirt that is available to order at an additional cost of £4.00 payable at registration. This gives runners the option to buy or opt-out. There is free parking on campus and hotel for all those stopping over. Those not staying in accommodation may use the Sports Centre facilities to park, change and shower. Parking is free but you need to validate a short stay ticket to park. Campus Accommodation - Are of probably '3 Star' hotel standard and all en-suite. Lancaster House Hotel Accommodation - Four Star Hotel with indoor pool and excellent facilities - Hotel located three minutes from race start and Presentation venue. All room combinations are subject to availability so first come, first served. Once this accommodation is booked then competitors will need to make their own arrangements. Those wishing to share with another runner can specify their share name when they book and visa versa. Full breakfast Is included with all types of accommodation. This will be in the 'Lica' Function Room a short walk from all accommodations. We have decided to use 'Book It Zone' to manage all payments. This means that each competitor will be asked to book individually and pay one fee direct. 2. The email address of the competitor is included so we can verify this and communicate direct with the runner. Instant payment and entry confirmation. Ensures all data is accurate and available to the event organiser. Allows the organiser to easily comply with new GDPR legislation. Increases the overall commitment to compete. There is no booking fee added as this cost will be included in your overall entry fee or accommodation fee price. This booking fee is minimal and the benefits are great and ensure overall smooth running of the event. Please enter me for the above event. I accept that the organiser will not be liable for any loss, damage, action, claim, cost or expenses which may arise in the consequence of my participation in or attendance to this event. I declare that I will not attend unless I am in good health on the day of the event and accept that I attend at my own risk. In the unlikely event of abandonment or cancellation, all or part of my entry fee may be retained for the management and administration of the event. No entry fee, presentation meal or accommodation refunds. However, transfer of entry and other bookings to another runner will be permitted. Information about the organiser: Secretary of the Lancashire Constabulary Sports Club.